They would love it if you joined them as they take in some of the best pubs in the city and as you walk from place to place you will get to hear their very own George wax lyrical about all things Moor and beer and try a different beer in each pub! They will be starting at West End Brewery at 6:30 were they are hosting an all-female brewed draught Tap Takeover and you will try through some cans (did someone say road beers?!) Then you will saunter (or however you like to perambulate) to Head of Steam Leicester where you will be getting all casked up! From there it is only a short stroll to Broood for a blind tasting event – they have entered 1 beer so double points to whoever manages to guess which is ours – They are really looking forward to this one/ looking forward to embarrassing themselves by not picking theirs out! You will then wander jauntily to The Blue Boar to carry on the cask theme before heading back to The Two-Tailed Lion for some good times! Updates will be posted on their social media so keep watching this event and Instagram stories to find out where they are and what we are up to! Check out our Facebook Page for full details. Welcome to Saturday or LBW Day 3. 10% off all Ales and Craft Beer at the Queen of Bradgate. We’ll hopefully see you all around town today. Author LeicsBeerWeekPosted on September 22, 2018 Categories Uncategorized2 Comments on Welcome to Saturday or LBW Day 3. 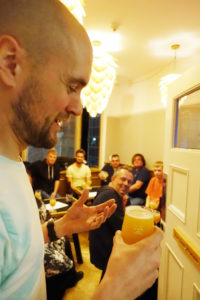 Last Nights Cloudwater Event, hosted by Matt and Alice, at the Two-Tailed Lion was a great success. 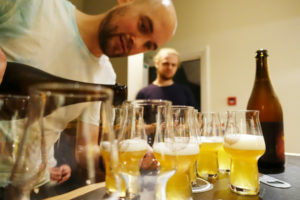 A packed house got to sample six of Cloudwaters amazing beers including a few very limited Bottled Beers, some were from the last cases in existence and learn how they were brewed and fermented. A great evening of Beer and Banter was had by all and we even got to learn about two new Micropubs opening in Leicestershire. The Two-Tailed Lion also has a Mount Saint Bernard Abbey Meet the Brewer event on Saturday 22nd and a Moor Beer event on Thursday 27th, there are tickets available for both events, so make sure you grab one to avoid disappointment. All of the planning is finally over and Leicester Beer Week is here. For the next day join us in Celebrating all Styles and Types of Beer at some of the wonderful Venues around this great City of ours. Brewsters at The Ale Stone and Blue Boar. £10 Beer and Burger at Firebug. We’re nearly there, just two days to go and it will be the Start of Leicester Beer Week 2018. There are loads of events for everyone to enjoy at all of the Venues across the City over the next 11 days. We’ll keep the list up to date both here on the website as well as the Leicester Beer Week Facebook Page. 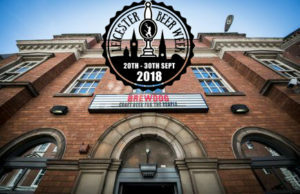 If you are attending any of our events this year please feel free to post images or send them to events@leicsbeerweek.org and we will get as many as possible posted. Don’t forget to use the hashtag #leicsbeerweek on all of your social media posts. Planning, Planning, Planning… Leicester Beer Week has not even Started and we’ve arranged our Closing Party!!! Come and share your creations, favourite beers, tips and tricks. We’ll have music, great company, pizza, and of course BEER! It’ll be a beer party for the ages, so don’t miss out! Free entry, kicking off at 4pm so you have time to shake the hangover from the night before! Our Friends at Framework Brewery are opening a Tap Bar at the Brewery on 21st and 22nd September to Celebrate the Start of Leicester Beer Week. A unique chance to drink their Beer where it was made and chat to the people that made it! 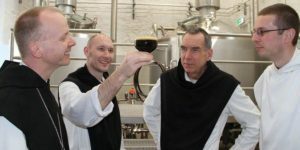 They are planning to have 4 beers available each day, with a mix of core beers and one-off specials. Author LeicsBeerWeekPosted on September 11, 2018 September 12, 2018 Categories Breweries, Events, NewsLeave a comment on Framework Tap for LBW. Another of Northern Leicestershires Breweries have Joined Leicester Beer Week. 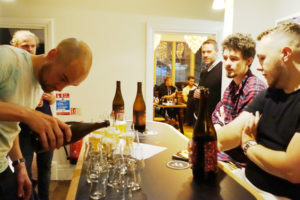 Tollgate Brewery based close to Calke Abbey will be getting involved in our first ever celebration of Beer and will be showcasing their beers at events across the city.